Does snoring effect your sleep? Wake you in the middle of the night? Keep loved ones up? Cause insomnia? Leave you feeling tired in the morning? Our product is a simple and safe solution to your problem. Now you and your loved one can get instant relief from snoring and wake in the morning full of energy and well rested. Anti Snoring Vent - Our unique design matches the natural shape of the nostrils. 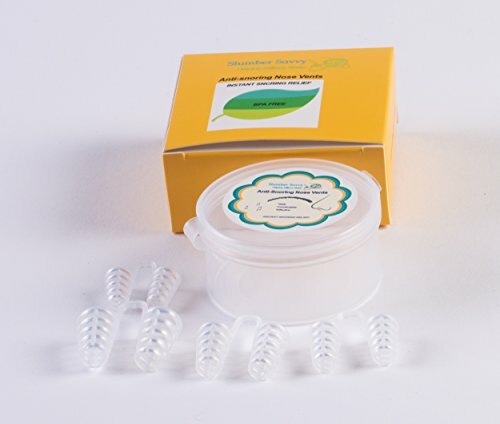 Thanks to this snoring solution, you can easily maximize the airflow in the nasal passages. High quality medical silicone in the snoring device allows you not to worry about your health while you sleep. This Anti Snore Product is hypoallergenic, not noticeable, odorless, and does not cause any side effects. Our anti snoring aids come in a plastic case that protects against dust and dirt. Great for traveling. Gently insert the Anti Snoring Vent into your nose. Enjoy a comfortable quiet nights sleep without snoring or disturbing others. Rinse nose vents with soap and warm water before or after use. First time users should try them for an hour before going to bed to get used to the feel.